Storm Dylan has lashed parts of Ireland and Wales with howling gales in excess of 70mph and squally rain as it bears down on the UK mainland. Forecasters have warned of severe gusts of up to 80mph as the storm brings a wet and windy end to 2017. Met Eireann said the strongest winds were recorded at Mace Head in Co Galway, where 74mph speeds were clocked, while the Met Office said gusts of 70mph had been detected at Aberdaron on the Llyn Peninsular. The highest wind speeds recorded in Northern Ireland were gusts of 59mph in Killowen, Co Down. The UK weather service has issued an amber warning covering Northern Ireland and parts of western Scotland, stating there is the potential for "injuries or danger to life" from flying debris, while a yellow warning extends into northern England and across to the Lothians. Irish forecasters have issued an amber warning of "violent gusts" and coastal flooding from high seas, along with a yellow warning for inland areas. 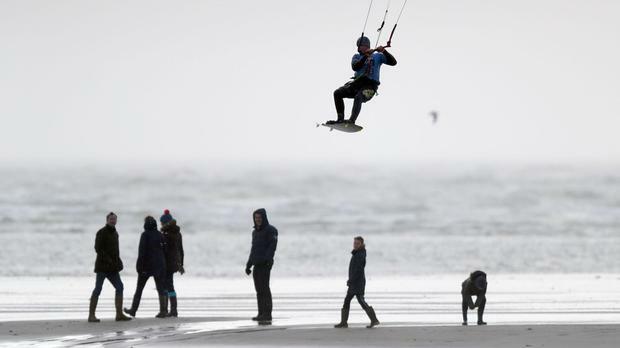 Wind speeds were expected to increase throughout Sunday morning as Storm Dylan crossed the Irish Sea, its centre on a collision course with Scotland. In Scotland, there was some travel disruption as the country geared up for its traditional Hogmanay celebrations. Several CalMac ferry services on the west coast of Scotland have been disrupted and some road routes and train services are also affected. ScotRail services from Glasgow Central to Largs/Ardrossan Harbour and between Helensburgh and Edinburgh were among those partially affected on Sunday morning as a result of high winds and heavy rain. Scotland's bridges were also affected in the first half of New Year's Eve. The Tay Road Bridge and Forth Road Bridge were closed to double-decker buses as the high winds hit and the Erskine Bridge was closed to high-sided vehicles. The Queensferry Crossing had a high winds warning in place with a 40mph speed limit. SP Energy Networks tweeted that it was working to restore power after a loss of supplies in parts of Kilsyth, Helensburgh, Glasgow, Bathgate, Carluke and Larkhall. The Scottish Environment Protection Agency (Sepa) has issued seven flood warnings for parts of south-west Scotland. However, with severe weather warnings due to expire by Sunday afternoon, organisers of Edinburgh's Hogmanay celebrations have said they expect the event to go ahead unaffected by Storm Dylan.